The development of the Charter, the first of its kind in third level education history, has been engineered by the Irish Universities Association and was launched at an event in Dublin on September 17th. DCU is one of seven Irish universities who have launched a coordinated campaign to make the Irish education system the best in Europe by 2026. 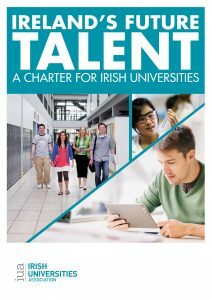 The charter, called Ireland’s Future Talent, identifies six central objectives and commits to delivering a fit for purpose university system for the evolving demands of society. The development of the Charter, the first of its kind in third level education history, has been engineered by the Irish Universities Association and was launched at an event in Dublin on September 17th. DCU are involved in the Charters’ development along with, Maynooth University, National University of Ireland Galway, Trinity College Dublin, University College Cork, University College Dublin and University of Limerick. The six core commitments that the universities hope to deliver include, building on the quality of the student experience in a digital age, increasing the scale, scope and impact of investment in research and innovation, expanding student access with communities and industry, supporting a programme of staff development and increasing equality and diversity, creating more flexible and securing the investment and resources to achieve these ambitions. Targets for the Charter include, increasing lifelong learning for people aged 25 to 64 from the current 6.5% to the EU average of 10.7% by 2030, increasing the output of PhD graduates by at least 30% over the next 10 years and working with the government on legislative reform to deliver a more flexible operating structure, with a better capacity to respond to the needs of the economy and society in general.